I’ve never seen so many yarn vendors in one place before. Granted, the convention centre was actually quite small. We did the loop a couple of times, me clinging to my money and wondering where I was going to lose it first. I should’ve really known from the start where I was going to spend my money. 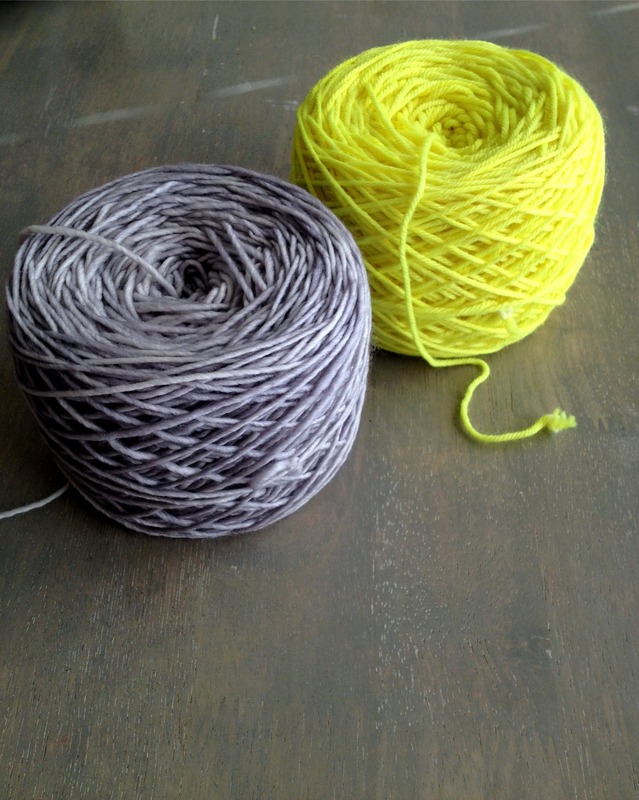 I’d been eyeing this gorgeous Madeline Tosh Merino DK yarn in a colour called Edison Bulb over on Purl Soho for a while. It’s bright. It’s vivid. It’s just too much. It’s been on my Pinterest board “Things I Just Want” for a little bit. I just hadn’t gotten around to actually buying it. Call me cheap. When we got to the Madeline Tosh booth, though, I got a bit excited. The first skein of Edison Bulb I spotted left a bit to be desired. It was nice, but just didn’t pop. The second was a bit better. Then husband pointed over to one in the midst of greys and said it looks much brighter against those dark colours. We went over and no, it looked much brighter because it was much brighter. I think I nearly squealed with delight. It’s so much brighter and more brilliant than online. While there, I grabbed a grey as well. I know I want the two together, but I just don’t know how I want them yet. I’m thinking a cowl maybe. We’ll see. I may just have to go on to Ravelry and look around a bit. Speaking of Ravelry, there was a whole Ravelry corner! I didn’t go in, but we did peek in. There was a circle of women with these beautiful spinning. It was so cool to see. They were just socialising and spinning as if it was the most natural thing in the world. I suppose in cases like this, it really is. Watching them did reaffirm with me that I really do want a spinning wheel someday. There was something so graceful about their movements, almost effortless. The other thing I picked up was a stitch dictionary for the computer. I’d like to branch out and experiment a bit more with the stitches I use, and this seemed a good way to start. We only spent an hour or two at the DFW Fiber Fest, but I really enjoyed it. Then, we popped over to the British Emporium just down the road. See, my husband grew up in South London and moved here to marry me. He misses a lot of the foods sometimes, among other things. Going to the British Emporium was like Christmas (for both of us, really). We got Crunchies (I missed them so much! ), curry sauce, Jelly Babies, Eccles cakes, and a whole bunch more. He seemed so happy; I’m glad we stopped by. All in all, it was a good weekend. Now, I just need to figure out what to do with this amazing yarn.